I had been wanting to see Changeling since it was out in theaters. I finally got around to it on DVD. It's a very very good film but I don't know if I could watch it again...so sad. Angelina Jolie deserved her Oscar nod. 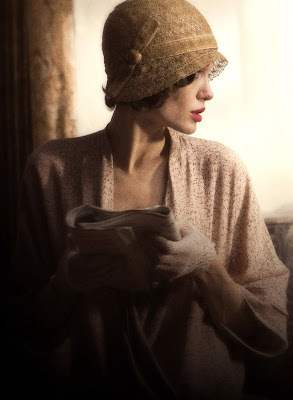 As Christine Collins she's submissive, soft-spoken and highly emotional (the epitome of what men viewed women to be back then). Amazing acting all the way. I'm glad she stuck it to the LAPD for being assholes. I do love Jeffrey Donovan in "Burn Notice" and it was nice to see him play the bad guy and trust me he's a very bad guy. 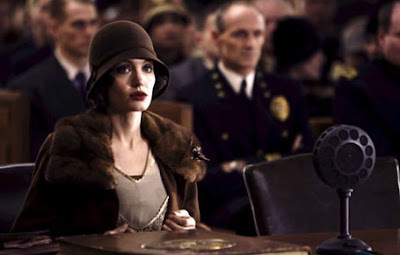 I hate Angelina, but I do admit that I like her look/style in the photos from this film. I want her hats. I love that one in the first picture!